My Little Pony—one of Hasbro's most recognizable and beloved toy lines—has been flying off shelves since it debuted in 1983. Here are a few things you might not have known about the toys, the TV shows they starred in, the Bronies they inspired, and their upcoming movie. 1. A REAL-LIFE PONY INSPIRED CREATOR BONNIE ZACHERLE. 3. … UNTIL EVENTUALLY, A HIGHER-UP ASKED FOR A PONY TOY. In 2014, Zacherle recalled that, a year after she had given up on her toy horse design, a friend of hers at Hasbro told her, “You know, Bonnie, our boss has this idea and it’s really the same as yours only it’s not a horse, it’s a pony. And he wants to make it big and have all these extra mechanical things in it.” Zacherle was asked to sketch a design for the pony. 4. MY PRETTY PONY DEBUTED IN 1981. The more than 10-inch-tall toy was made of hard plastic and had a lever under the chin that made the toy’s ears wiggle, its eye wink, and its tail swish. My Pretty Pony was relatively successful, selling a couple million units. 5. A MARKETING EXECUTIVE’S WIFE SUGGESTED TWEAKS THAT LED TO MY LITTLE PONY. After My Pretty Pony’s moderate success, Hasbro’s Vice President of Marketing brought one of the toys home to his wife and asked her to evaluate it—and she had some feedback. “She said, ‘Well, it’s good, I guess, but I think it should be small and soft, have combable hair, and [be] played with like a doll,’” Zacherle recalled. “So, consequently he took his wife’s advice—smartly—and came back to me and said, ‘Listen, I want you to make exactly the same toy, only shrink it down and make it soft and, you know, combable hair, and don’t change a thing about it.’ I didn’t even redraw it, I think I just shrunk the original drawings. ... So that’s how it got to be that small.” The new ponies were 5 to 6 inches tall and made of much more snuggly vinyl. Hasbro filed a patent for My Little Pony in August 1981; it was granted two years later. There are three inventors listed: Zacherle, Charles Muenchinger, and Steven D. D’Aguanno. Muenchinger, a sculptor at Hasbro, turned Zacherle’s drawings into a physical form that could be reproduced; D’Aguanno was the General Manager of Research and Development at Hasbro at the time. 6. MY LITTLE PONY WAS INITIALLY SUPPOSED TO BE A GENDER-NEUTRAL TOY FOR PRESCHOOLERS. The bright ponies we know and love were not what Zacherle initially had in mind. She envisioned toys that looked like real animals—“appaloosa, dappled grey, palomino, pintos”—and would be played with by preschool girls and boys. She created ponies that “were all exactly the same as the original My Pretty Pony, which was a palomino, and just shrunk down,” she said in 2015. “The colors came about when my friend, who was Marketing Director … said ‘Bonnie, what do you think of pink and purple?’ And I said, ‘Get out of my office!’ She said, ‘Little girls like pink and purple.’ I said, ‘I don’t care!’ […] I was a preschool toy designer and in preschool really it wasn’t girls or boys […] She said, ‘Well, why not wait to test it.’” Zacherle said OK, and, after testing, the company went with the bright colors. 7. THERE WERE SIX ORIGINAL PONIES. A G1 Buttercup in the Flatfoot pose. Image courtesy of eBay. Snuzzle, Butterscotch, Blue Belle, Minty, Blossom, and Cotton Candy were produced in 1982. They were made in what’s now known as the “Flatfoot Pose”—so named because they were the only My Little Ponies to have flat rather than concave feet—with heads facing forward and down. The pose wasn’t used again after that first year. 8. THE TOY ALMOST DIDN’T GET RELEASED. Generation 1—which included several different poses—ran from 1983 to 1992, and while they started with just six characters, Hasbro was constantly expanding the characters and types of ponies available: Soon, there were unicorns and sea ponies, pegasus ponies and flutter ponies, sparkle ponies and glow 'n show ponies (which glowed in the dark), so soft ponies (which were fuzzy) and scented ponies, secret surprise ponies, which had a secret compartment containing a surprise, and Drink ‘n Wet baby ponies, which came with diapers that revealed patterns when the toys wet themselves. Hasbro’s imprint Kenner, which they had purchased in 1991, produced the G2 ponies, which ran from 1997 to 2003. These ponies—which are skinnier than their predecessors—are not popular with collectors. The ponies released as part of G3 (2003-2009) more closely resembled the G1 ponies. In 2009, the dramatically-redesigned G3.5 ponies debuted; the line was available until 2010. The current generation, G4, was released in 2010 and includes ponies from the My Little Pony: Friendship is Magic animated series. Hasbro has released 600 ponies in the United States. 10. RARE PONIES CAN GO FOR A LOT OF MONEY. According to Collectors Weekly, Hasbro didn’t just release My Little Ponies in stores; they also sent out mail-order ponies. (One, a Rapunzel Pony, went for as much as $800 four years ago.) The company also released its molds to companies all over the world. Summer Hayes, author of several collectors guides, told Collectors Weekly that in 2012, “collectors discovered a whole separate line of Ponies that were produced in Venezuela that we never knew about. Someone found a stash of mint-in-box '80s Venezuelan Ponies, and of course, they went on eBay and sold them to collectors. We don’t know everything. I’m sure we’ll get to a point where there’s no new information, but it seems like every couple of years we find a new country or a new variation.” A Greek version of a G1 pony in a rare pose is currently available on eBay for $750. 11. 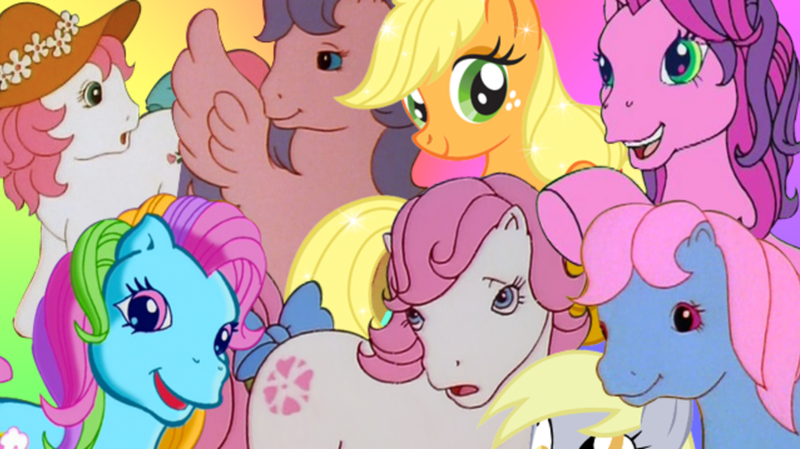 THE FIRST MY LITTLE PONY TV SPECIAL DEBUTED IN 1984—AND IT WAS CO-PRODUCED BY MARVEL. Founded in 1978 with Hasbro as its main client, the ad agency Griffin Bacal didn’t just make commercials—it also created an animation studio called Sunbow Productions to produce TV specials, full-length movies, and TV shows based on Hasbro toy lines. Sunbow partnered with the animation arm of Marvel to create cartoons for G.I. Joe, Transformers, and, yes, My Little Pony. The first special, called My Little Pony when it was first released in April 1984, was later rebranded Rescue at Midnight Castle. The second special, Escape from Catrina, aired in March 1985. The success of the specials led to a greenlight for the very first My Little Pony movie. 12. MY LITTLE PONY: THE MOVIE WAS MARVEL’S FIRST DOMESTIC THEATRICAL FILM. My Little Pony: The Movie, which featured the voice talents of Cloris Leachman, Rhea Perlman, Danny DeVito, Tony Randall, and Madeline Kahn, was released in June 1986. It debuted more than a month before Willard Huyck’s Howard the Duck, making My Little Pony Marvel Studio’s first domestic theatrical film. But its debut was not exactly auspicious: Critics panned the film—the Los Angeles Times said watching the movie was like “being immersed in cotton candy for an hour and a half: The sticky-sweet cuteness is piled on so thickly that adults leave the theater checking their teeth for new cavities. … [T]he real theme song of 'My Little Pony' is the ring of the cash register, as Hasbro attempts to turn unwitting young viewers into customers. The sugary cuteness of the Little Ponies masks a corporate greed as cold and sharp as a razor blade”—and it grossed just $5,958,456 at the box office domestically. 13. MY LITTLE PONY 'N FRIENDS, THE TOY LINE’S FIRST TV SERIES, DEBUTED IN 1986. The show, which premiered in September 1986, ran for two seasons. Each half-hour episode featured one segment of Pony tales and one segment of “Friends”—i.e., other Hasbro toys. The Glo Friends featured Glo Worms; MoonDreamers featured a line of dolls of the same name; and Potato Head Kids was about, you guessed it, Mr. Potato Head's family. Breckin Meyer voiced one of the characters. It wasn’t MLP’s only show—My Little Pony Tales, which followed the very teenage-girl-like adventures of the ponies Starlight, Sweetheart, Melody, Bright Eyes, Patch, Clover, and Bon Bon, debuted in 1992. It aired for one season and then in syndication. There were also a number of direct-to-DVD MLP specials released from 2003 to 2009. 14. MICHAEL BAY’S TRANSFORMERS MOVIES DIRECTLY LED TO MY LITTLE PONY: FRIENDSHIP IS MAGIC. The first live-action Transformers movie, which was released in July 2007, made a boatload of money for Hasbro. Later that year, the Los Angeles Times reported that the company “wants to turn more of its line of toys into concepts for movies … after this summer's blockbuster Transformers generated $702 million in worldwide ticket sales, making it one of the most successful toy-based movies in history.” The company hired Lisa Licht, formerly of 20th Century Fox, to be General Manager of Entertainment and Licensing and, in May 2008, reacquired the rights to its Sunbow-produced shows (which belonged to TV-Loonland). Global License reported in June 2008 that “Hasbro is working on a new entertainment component for 2009” for the My Little Pony franchise. This was likely Friendship is Magic. 15. FRIENDSHIP IS MAGIC CREATOR LAUREN FAUST APPROACHED HASBRO ABOUT MAKING A LINE OF DOLLS. Instead, Faust wanted her ponies to be three-dimensional characters that experienced more action and adventure than typically seen on shows for girls. 16. FAUST CREATED A “PITCH BIBLE” TO SHOW PROOF OF CONCEPT. To bring her concept to life, Faust quickly got to work on what would become a more than 40-page-long pitch bible. She hired artists to create backgrounds and help to develop the look of the characters and world and did all of the writing herself. After she presented the initial version of the pitch bible—which included character designs and descriptions, as well as locations and world dynamics—Hasbro hired the production studio Studio B, which placed Jayson Thiessen as supervising director. They made a two-minute short, and Friendship of Magic was greenlit to series. 17. HER PONIES WERE INSPIRED BY GENERATION 1 TOYS—AND THE CHARACTERS SHE CREATED AS A CHILD. 18. HASBRO HAD PLENTY OF SAY IN ELEMENTS ON THE SHOW THAT COULD BECOME TOYS. Faust served as the Executive Producer for the first season, but by the second season she had become a consulting producer and had left before the third season premiered. Though neither Faust nor Hasbro commented on her departure, Longreads noted that it may have had a little something to do with the spin-off show Equestria Girls, “which turned the adventurers of My Little Pony into ultra-skinny, status-obsessed high-school girls who are one thousand percent about combing hair and changing clothes. In order to effect this transformation, the ponies leap through a mirror into an alternate universe.” In 2014, Faust told New York magazine, “It's very painful for me. I poured my heart and soul into My Little Pony. I left the show, but I kind of feel like it was taken away from me.” After Faust became consulting producer, Thiessen took over as showrunner. 19. NO ONE EXPECTED THE BRONIES. Even celebs are fans of the ponies: Weird Al Yankovic made a cameo as a pony named Cheese Sandwich in a 2014 episode, and Andrew W.K. is a confessed Brony (he identifies with Pinkie Pie). 20. A NEW MY LITTLE PONY MOVIE IS COMING THIS YEAR. Based on Friendship is Magic, the movie will feature the “Mane 6” characters and the people who voice them—Tara Strong, Andrea Libman, Tabitha St. Germain, and Ashleigh Ball—as well as a number of celebrities lending their voices to new characters. Emily Blunt, Kristin Chenoweth, Taye Diggs, Uzo Aduba, Sia, Liev Schreiber, Michael Peña, and Zoe Saldana have all signed on to voice characters. The movie will be released in October.